I received a copy of the DVD in exchange for an honest review. Creatively gifted, college student Chloe Moray finds solace from a difficult childhood in her extraordinary art. But when an alarming dream begins to recur nightly, Chloe starts to believe that it might be a suppressed memory and that she may have witnessed a terrible crime as a little girl. Her search for peace takes her on a journey that forces Chloe to confront her past traumas and leads her to cross paths with Josh, a young man dealing with his own painful loss. Together they find in each other someone they can trust as they seek to unlock a cold-case mystery from years before. But with the authorities blocking the way, Chloe’s new-found hope is challenged in this powerful story of faith, triumph and healing. 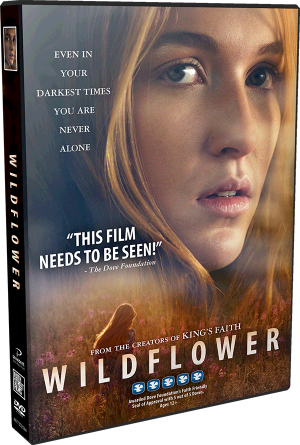 If you’ve ever struggled in the aftermath of a difficult situation; if you’ve ever wondered if someone (anyone) will listen to you; if you’ve ever wished there was a safe place you could go, WILDFLOWER is a powerful reminder that hope can be found even in your darkest moments. The Wildflower movie is a bit slow to start but quickly grabs you and pulls you in. It’s powerful and moving and you really feel for the main characters once they draw you in. The movie wasn’t a real shocker but it wasn’t completely predictable either, sort of in between. I liked that although faith and religion is mentioned and shown, it’s not overly religious and should be fine for those who aren’t into faith movies. The main characters are not religious. If you are affected mentally by movies like me then be prepared to feel your emotions go haywire and even to feel scared a few times. If you like to check out movies that aren’t the typical box office hits, Wildflower is a good place to start.